Seahorse cookies are legend in our family. My grandma used to make hundreds of cookies every December and bring them out one tin at a time, one tin after another, to be happily seized upon by all of the aunts and uncles and cousins. Grandma made lots of types of cookies, but the seahorses were everyone's favorite. These tender almond-flavored sugar cookies are iced with vanilla buttercream and studded with cinnamon red hots and colored sprinkles. They're pretty unusual as Christmas cookies go, which makes for a unique and special family tradition. I think of Grandma every year when I bake these cookies and I think of her again every time I pull a cookie from the tin. My grandma shaped every cookie by hand, first rolling the dough into little snakes and then forming wreaths, candy canes, and--for reasons that escape me--seahorses. Merry Christmas, have a seahorse! In honor of Grandma, we follow a very strict protocol when we make these cookies. Wreaths must be green with three red hots, candy canes must be white with three red hots, and seahorses must be pink with one red hot for an eye. We love these cookies for the memories, but they also happen to be pretty delicious. 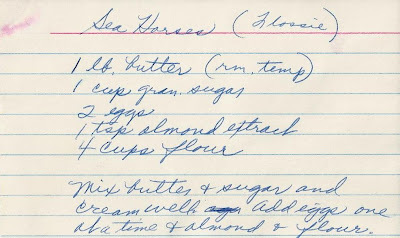 Recipe from Virginia McGovern. Makes 8 dozen cookies. Use a mixer to cream together the butter, sugar, and salt (or use salted butter and omit the salt). Mix in the eggs one at a time, then the almond extract, then the flour. If the dough seems dry, sprinkle it with a few drops of water until it just sticks together and doesn't crack when press your hand into it. I usually divide the dough into three big balls, then divide each piece into 32 smaller balls by halving the dough four times (the balls should be slightly less than 1" each). The dough should then be chilled in the refrigerator until it a is bit firmer and easier to work with. 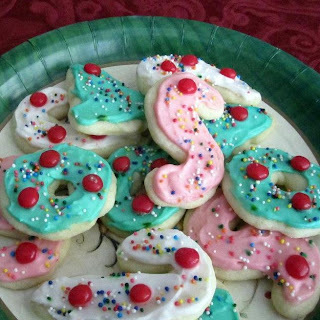 Shape the cookies by rolling the balls into little snakes, then forming them into wreath, candy cane, and "S" shapes. Press down lightly until the cookies are a little less than a quarter inch thick. Bake at 350 degrees for 8-10 minutes. The cookies should not brown at all and will seem a bit soft when they come out of the oven, but they should taste dry (not doughy) if you bite into one, sort of like very tender shortbread. Cool the cookies in the pan until they firm up a bit, and then move them to a cooling rack until they are completely cool. Make the icing by combining all the ingredients in the mixer. Add just enough milk or cream to get a spreadable consistency. Dye the frosting with food coloring, then spread it on the cookies and immediately decorate them with red hots and sprinkles. Allow the cookies to sit out for a bit, until the icing hardens slightly. Then transfer them to an airtight container (a Christmas tin?) 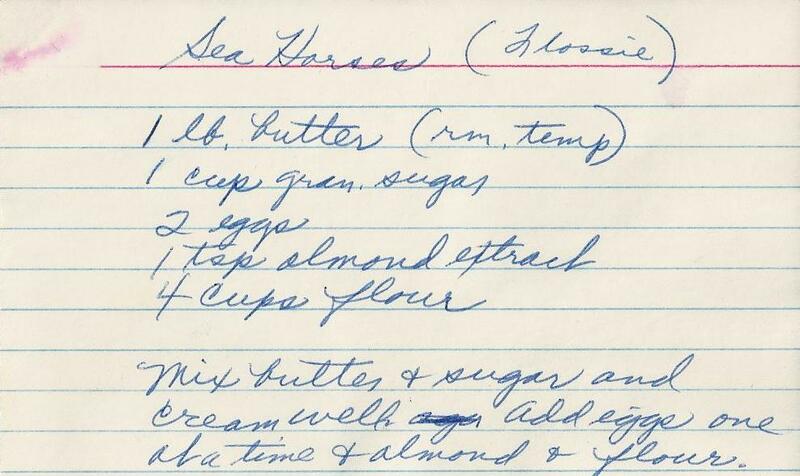 and share generously--this recipe makes 96 cookies! A friend of mine brought this bean salad to a Kentucky Derby party a few weeks ago. It was a bright, warm, blue-sky day, the guests wore sundresses and seersucker, and there was a very nice potluck spread. 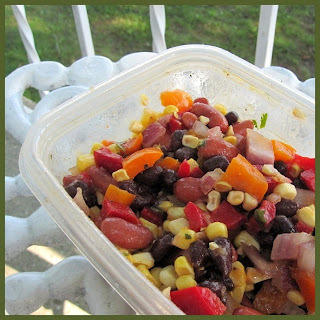 I wasn't particularly excited about the bean salad when I spooned it onto my plate, but I took one bite and fell in love. I made the recipe myself for the first time this weekend, and it easily earns a top spot on my list of quick, easy, worthwhile dishes. It's basically beans, corn, bell peppers and onions in a cumin and cilantro vinaigrette. The acid and sugar are nicely balanced (you won't notice the sugar and you won't feel like you got knocked over the head with a bottle of vinegar), and the other flavors are savory and refreshing. It's really very tasty. Also reasonably healthy. And vegetarian. One recipe makes a little over 10 cups, so it feeds a lot of people. Keep it in mind for potlucks or cut it in half for a smaller group. Adapted from a recipe shared by Logan Casey. Makes 10-12 generous servings. Put all of the salad ingredients in a large bowl. Whisk the dressing ingredients in a smaller bowl until the sugar is mostly dissolved, then pour the dressing over the salad. Mix everything up and marinate for at least a couple of hours and no more than a day or two. Garnish with additional freshly chopped cilantro. 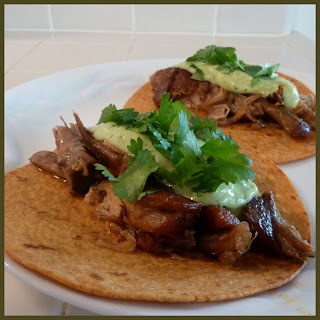 Carnitas is one of those special dishes in which a tough, humble cut of meat is transformed, through hours of slow heat, into something really wonderful. Each bite of pork is full of flavor, incredibly tender, and pleasantly crisp around the edges. It makes a tasty filling for tacos or enchiladas or whatever else you can think of. I researched lots of recipes before working out an approach that I think is particularly easy and delicious. It takes a long time--you'll need to be home for a good half day-- but it involves very little work. Big chunks of pork braise uncovered in the oven for several hours, then the meat is shredded and returned to the oven to essentially "fry" in a bit of the rendered fat. The end result is juicy and flavorful with crispy edges. No need to trim the fat from the meat. It's easier to cook the meat as it is and then discard any big pieces of fat at the end. The big chunks of cooked pork need to be pulled apart into bite-sized pieces, and the globs of fat are pretty easy to spot and remove while you're at it. Plus it's good to have the extra fat in the pan while the pork is braising (see next point). Traditional carnitas recipes call for obtaining lard and cooking the pork in that, but I find that the meat itself renders enough fat during its long stay in the oven to more than get the job done. Some recipes call for browning the meat on all sides before putting it in the oven. However, the part of the meat that is above the surface of the braising liquid at any given time gets nice and brown from the dry heat of the oven. So even without browning the meat ahead of time, you wind up with a flavorful, nicely browned exterior. Avoid shredding the meat while it's still hot. It's important to give the pork a quick rest to let the juices redistribute through the meat. I was in a hurry and shredded the meat right away once, and the pain of burnt fingers wasn't nearly as upsetting as the disappointment of dried-out carnitas. 3-5 pounds pork shoulder, with or without the bone (Choose what sounds good for the number of people you're feeding and adjust the seasoning amounts accordingly. No matter how much I make, I never seem to be lucky enough to have leftovers, so you might want to overestimate a little on portion sizes). Heat the oven to 350 degrees. Cut the meat into 3-5 squarish bricks and put it in a 9x13" glass pan (or any oven-proof dish) with some space around each piece to allow the meat to brown on the top and sides. Between the pieces of meat, sprinkle the kosher salt, chile powder, cumin, garlic, and bay leaves. Add enough water to come about a third of the way up the meat and swish things around to evenly distribute the seasoning in the liquid (everything should be in the water, not on the meat). Put the pan in the hot oven, uncovered. After one hour, take the pan out and use tongs to turn each piece of meat. Return the pan to the oven and continue to turn the meat once every 30 minutes. The pork should develop a nice dark crust as it cooks. If it doesn't, the meat might be too crowded or you might want to turn up the temperature in the oven a bit. Cook for a total of about 3.5 hours, or until the meat falls apart when you poke it with a fork. There should be very little liquid (and plenty of fat) in the pan at the end. Don't let the liquid evaporate completely;if it does, add a little extra water to the pan. Remove the pork from the oven and let it rest in the pan for about 15 minutes, then use your hands to pull it apart into bite-size pieces. Discard any large sections of solid fat. Pour off most of the rendered fat from the pan (keep a tablespoon or two in there), then return the meat to the pan and stir. Put the pan back in the oven for another 30 minutes to allow the carnitas to get crispy at the edges. Serve the finished carnitas in whatever format you like (tacos, burritos, enchiladas, nachos, etc.). Black beans and any good green sauce makes great accompaniments (I like this sauce for tacos or this for enchiladas).